When you begin with JavaFX, one problem you might come up with is the communication between different controllers to communicate between scenes. In this article, we will see how to properly communicate between two different controllers in JavaFX. The solution here is to get the controller from FXMLLoader. We use JavaFX FXMLLoader for inflating fxml and loading new views. This loader has a method called getController(). getController method will return an instance of the controller corresponding to the view we are going to load. In this example, we take input to a text field from the user. When a button is clicked, new window will be opened and we pass the typed text to new window. 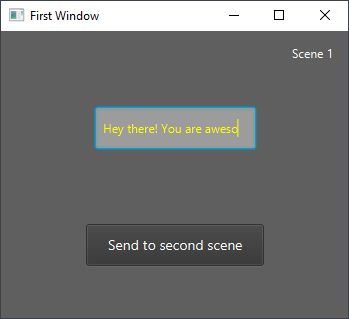 When the button actionBtn is clicked, a new window will be called which is the second scene window. We take the input from inputField textfield and pass it with transfer data. This controller is really simple. You just have to write a method that accept the string. Once the string is received, we set that in the display textfield.